Visited this restaurant on an overnight stop in Montlucon. It's a fairly basic, family run Italian restaurant. The food was good and reasonably priced. The wine selection appeared only to consist of the red, rose and white wine of the house, but it was reasonably priced. We mostly had pizzas, all of which were good. and one of us had the duck breast, which was also lovely. Although very busy, the service was friendly if a little slow at times. Ate here twice recently. Food excellent, and very friendly staff. Not a "grand" restaurant, but one to be comfortable in and just enjoy the food and the buss around you. 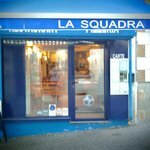 Been to La Squadra? Share your experiences!